At my last seminar,”RawTalk” I briefly mentioned my two favorite ways to convert to B&W. I also said that I don’t like to use the Grey Scale mix / convert to grey scale button as much and prefer to use HSL controls instead. After seeing a number of bewildered expressions I thought It was high time share a bit of my B&W workflow. How do i convert to black and white using the HSL adjustments? 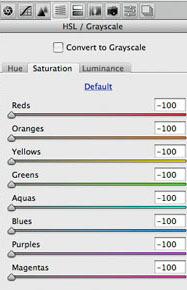 - Drag all Saturation sliders to zero in the HSL tab. 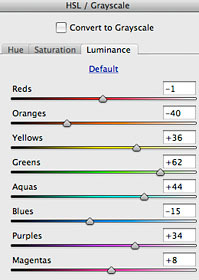 - Adjust the Luminance sliders in the HSL. *notice they respond similarly to the grey scale mixer but with much smoother gradations and less noise. - Shift the temperature and tint sliders in the basic tab. - Optionally increase saturation/vibrance sliders. * increasing saturation will give you more isolated control with the luminance adjustments. - Use color sliders in the calibration tab to further enhance separation. I started off with this landscape I snapped in the Dolomites. At this point I set saturation to zero in HSL and adjusted black and white clipping points in the basic tab. Here I built up more contrast to help the landscape feel more dramatic. To do this I used the luminance sliders, darkening the blues in the sky and lightening the green trees. I also adjusted the temperature and tint sliders in the basic tab to balance the tones overall. Lastly I made a few minor moves in the color calibration tab…. but why stop there. I felt that the image was well balanced and processed but a bit too boring for my taste. So since it was a mountain range in Italy after all, I wanted it to feel more expansive and have a sense of history. In the past I studied the work of Carleton Watkins and was very impressed with his Albumen silver prints and his seemingly tireless fascination with the landscape in the west so I went about creating that kind of look. BTW, if you’re in New York, don’t miss the American West photography exhibit at the MOMA, they have some beautiful Watkins prints. *seriously, sometimes you have to break the rules a bit. This enhanced local contrast *more volume in rocks. 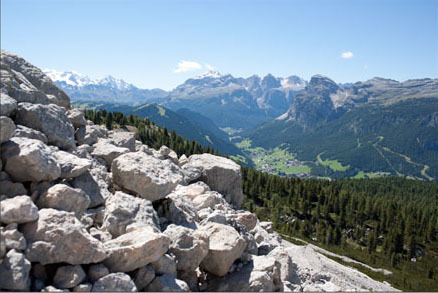 i.e (Haze) to mountains and darkened forground rocks for depth. this gave the image that Albumen printed look. *Note screen grabs are from ACR but all techniques work identically in Lightroom. As you can clearly see, using the HSL technique is extremely flexible, more so that just using the grey scale mixer. Sure you can argue that you may be able to get bit more contrast out of a grey scale mix in some cases. But in my experience this causes blocky tonal transitions and chunky noise, especially in the sky. With any conversion to B&W, be sure to examine the edges,skies, and transitions at 100% zoom for noise and posterization. You woulden’t want to get your prints back from the printer looking like you shot them with a Sony Mavica!